In Alexander Solzhenitsyn’s most autobiographical novel The First Circle, a diplomat says “A great writer is, so to speak, a second government. That is why no regime anywhere has ever loved its great writers, only its minor ones.” The writer as the conscience of the people has a long tradition in Russia both in Czarist and Soviet times. Turgenev was compelled to live much of his life abroad, and many of his works were suppressed. Chekhov felt this duty of public conscience so strongly that, even though suffering from tuberculosis, he insisted on making a long journey to the Sakhalin Islands to report on the conditions of exiles there. Leo Tolstoy was regularly censored and finally excommunicated by the Russian Orthodox Church which banned any prayers at his funeral. It was Solzhenitsyn’s novels and his documentation of the lives of people in the Soviet prison system which brought him to world attention and the Nobel Prize for Literature in 1970. His first short novel One Day in the Life of Ivan Denisovich was published in the Soviet Union, but his other novels and the monumental Gulag Archipelago were published from Western Europe. It was his own years spent in prison camps and forced exile in Central Asia which focused his sense of mission and his drive to awaken the Russian people to the inhumanity which the Soviet regime had wrought. 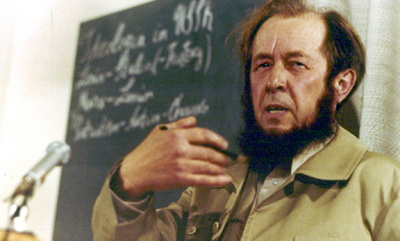 Solzhenitsy spent 18 years in forced exile in rural Cavendish, Vermont. When he returned to post-Soviet Russia in 1994, he often wrote and spoke in a tone considered pessimistic, deploring crime, corruption and a decline of spiritual values. Some saw these remarks as nationalistic. They are better seen in the spirit of Leo Tolstoy, highly critical of the current situation but calling for reforms through a strong inner light and a confidence in the strength of the rural population. Food for thought. It is perhaps worth pondering that at the Olympics in Russia writers such as Dostoevsky, Tolstoy and Solzhenitsyn were prominently referred to in its opening. They were integral part of the greatness of Russia. At the London Olympics on the other hand the first scene at the opening ceremony was that of a train spewing pollution into the air and bringing in industrial progress. It is not Shakespeare that makes England great but coal which allows for the industrial revolution and English imperialism. Indeed, it is not what happens that makes all the difference in the lives of nations and people but the interpretation of what happens which determines in part one's value system.